Periscope is an awesome way to broadcast live news and events to your family and friends, acquaintances, and even strangers who might want to see what is happening in your day in real time. Many businesses are using it as a great way to build community and deliver valuable content and information to their customers, but many are also using it purely for social interaction. 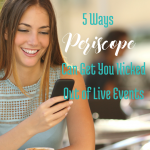 In addition to learning the proper etiquette for this new live streaming app that has taken the world by storm, there are also a few hugely important safety concerns that should be addressed and taken into consideration before every scope (Periscope's term for a broadcast), whether business or personal. And any business that allows it's employees or representatives to scope on their behalf needs to have their Periscope policies and proceedures down on paper and out to every single person – as soon as yesterday! Para leer esto en Espanol , haga clic aquí. You can choose not to tag your location prior to beginning your scope, however that makes you harder to find in the streams. If you do share your location, viewers do not have the ability to zoom in on your exact location, however Periscope will show a general map of your area. Because you do not have control over who watches your scopes, be very cautious of any personal information they could pick up either in words or surroundings. Does the front of your house and your house # show in the scope? Did you mention your street name? Did you say that the kids are always at ______ house on Saturdays? None of us like to think about the dark side of criminal minds and predators, but all of these little tidbits are puzzle pieces that can be put together to create a very bad picture. While you cannot prohibit certain people from following you, you can block the person or account from following you once you see them on the list and/or they become a nuisance. Just as there are trolls on blogs and other social media spaces, there are trolls on Periscope as well. Do you scope about your daily life? Do you share your routine with the world? Is it possible for strangers to learn your routines by watching your scopes? Do they know where you are every Tuesday at 3pm and approximately how long you will be there and how long it would take you to get home from there, and therefore how long your home, children and babysitter, etc. are unattended. Did you share that your husband will be out of town for 3 days? Have you given out your other social media links? Could they gather information about you and your family on those platforms? For business, are your employees scoping in areas that give away security routines, shift change information, locations of key tools for your business? Because of the conversational style of Periscope it is easy to forget that this is not just a chat between friends. For your own safety and that of those around you, you must remember every moment that anything and everything you publish on Periscope is live immediately for anyone in the world to find and watch now, and during the next 24 hours, unless you delete it as soon as you finish the scope. 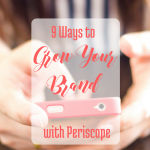 Never say anything negative about another person, brand or company on Periscope. You may say good things. You can and should of course be honest and not defaming. If you cannot think of something good to say, don't say anything about them and move on. Though I have no case studies to prove my point- yet (Periscope is still too new), it would be very easy for public comments on Periscope to come under legal fire as slander and liebel against the other party. You don't want to be help responsible for that. Just as you need model permissions, written consent and licenses to share images, quotes, excerpts online, you also need permission, at the very least verbally, to “scope” someone. Never walk into a conversation while live streaming without first announcing your plans to do so and getting their permission. Both the conversations and the faces could be something the other party does not want at the world's disposal. Better safe than sorry. I predict that many public places and businesses will soon have policies regarding Periscope. 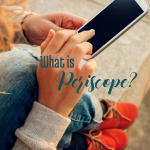 If you are unsure whether Periscope is allowed, either choose not to do it, or ask a manager if they have a policy on Periscope or if you could have permission to scope while there. 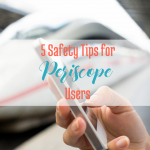 If you or someone in your family is scoping for personal use, the Periscope safety discussion is one you need to have very soon. It is important that you lay some ground rules for when and where scopes should take place, as well as what should and should not be done, shown and said, not just for their safety, but for that of the entire family. And please don't ever drive and scope at the same time! 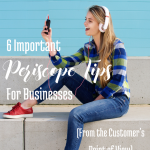 If you are on Periscope for your own business, some of the personal safety precautions also apply. 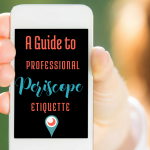 If you own or represent a company that is using Periscope for business, I'd encourage you to also have a discussion and establish company policies now for both safety and etiquette. How about you? Are you already using some of these safety tips? Have you had these discussions with your people? 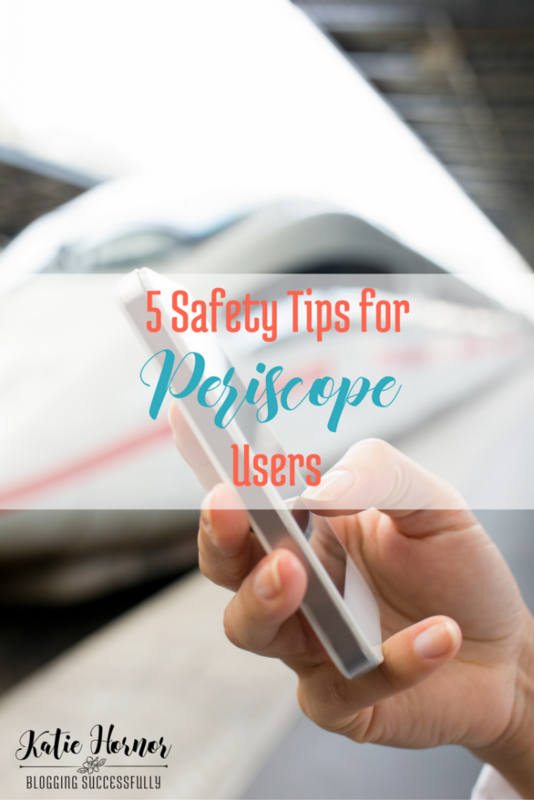 Are there other safety tips for Periscope users should be aware of? Please leave me a comment below. Very wise words! I’m happy someone else said it. You think you have nothing but friends on your social media lists. Sadly, one of my friends put out a message for all of her friends to meet her at a bar one night and she came home to a nearly empty house. A friend on her list knew where her hidden key was and was also friends with her dog. Be safe out there everyone! Oh, how awful! Yes, always be wise with location issues. We often don’t talk about events until afterwards for just this reason.